I think the weirdest first day for me was a traffic accident on the way there that made me ridiculously late. This was before I had a cell phone as well. 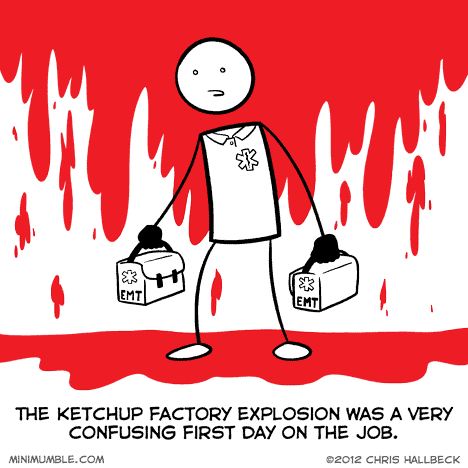 What is your weirdest first day of work? I remember getting shouted at for five minutes straight by a manager for not handing in a report on time until I finally managed to tell him I’d started working there three hours ago. He just glared at me and wandered off. Not technically work, but before the start of the first semester at University we were all scheduled to have an individual talk with the guy who mentors the first years. On my way there, the bus I with in had a head-tail collision with a taxi, so I ended up being late. I think that’s the only time I’ve ever seen a traffic accident with a mode of public transit while I was in it. Later, at the first lesson of that same guy’s course, I discovered he made it into an anecdote. I wonder if he ever told it again subsequent years. Also school-related: My first day of high school, mid-quarter because of a move, was the day after the funeral of a boy shot by another classmate – and I was assigned his seat in homeroom. Oh yeah, friendship and popularity awaited. other then working the census and working the polls once each.Ive had the same job my whole life so I guess I dont have many choice really. Same here, been working at a art gallery for about twenty years now, the first really real job I’ve ever had, and really no problems. I had the person who hired me quit the morning of my first day. Not surprisingly, I quit a month later. I love everything about this panel, by the way. Fantastic. As a student I took the bus to my first day on the job and wore a suit. This would be the only day I would wear a suit. Going home it rained heavily as I waited for the bus. I was drenched totally and felt like a complete loser as people looked at me on the bus. What? What are umbrellas? I still remember to this day my first day on the job for my first long term position. I was yelled at all day long, from the moment this bully stepped onto the bus at the gate (and so many other bullies when me and everyone else got off the bus to stand on the yellow foot prints) until I went to bed that night. God I miss my years in the Marine Corps. On the first day of my first job ever, company property got stolen without anybody realizing it.